If you’d have told me this time last year that I would be giving a talk at a WI meeting I wouldn’t have believed you. But it’s funny what a difference a year makes, and how simply helping at the school summer fair can lead from one thing to another. Last summer I made quirky planters out of children’s wellies and sold them at my daughter’s school summer fair to raise money for the school PTA. Little did I know that one of these wellies would be bought and given as a gift to a member of the local WI and the rest, as they say, is history. I had never been to a WI night before, so I had no idea what to expect. I was a little apprehensive - I certainly don’t speak in front of large groups of people regularly, if at all. I also felt like a bit of a fraud, as even though I had been asked to take the talk, I wouldn’t ever describe myself as a professional in ‘quirky planters’! Of course I was made to feel very welcome, and quickly realised I had no reason to feel nervous. After singing of a verse of Jerusalem and some WI business, I was up! 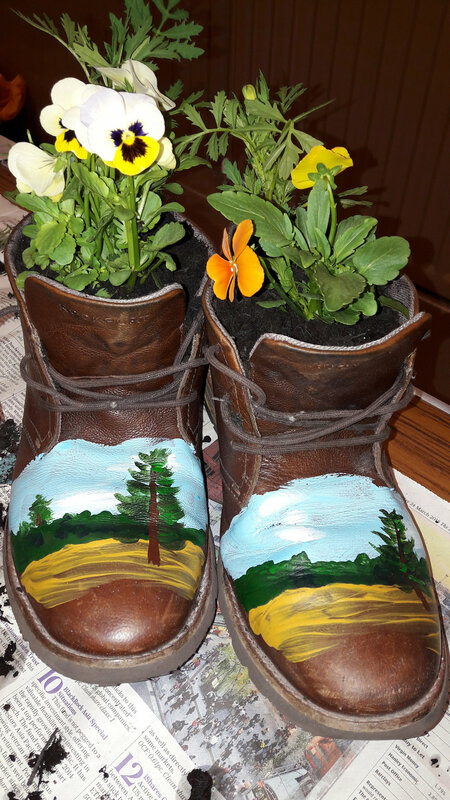 I briefly introduced myself and then dived straight into a demonstration of planting a boot, which a fellow RKHer had kindly donated and that I had already painted. I discussed the fact that another lovely aspect of these creative projects is that it gives a new lease of life to something that you may be thinking of binning. With quirky planters you’re only limited by your imagination! The ladies then had a chance to create their own quirky planters with items that they’d bought in from home. They did a superb job and went home thrilled with some fantastic new additions to their doorsteps and gardens! Despite my apprehensions, I left feeling really glad that I’d done it. It was a great experience and I was so glad I took myself outside my comfort zone for the evening. Older PostThe Facebook Pixel: what is it and why do you need one?